The importance of achieving self-feeding independence for the physically challenged child cannot be underestimated. 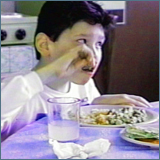 From social acceptance to the development of an independent self-image, the ability to feed oneself is one of the most important functional skills. This video presents a step-by-step reverse chaining method for introducing and developing independent self-feeding behaviors. Through specific handling of the utensil and the motor patterns required to be successful, this program can be easily carried out by any caregiver. Analysis of feeding patterns, developing self-feeding skills, preparation and positioning, and reverse-chaining techniques are presented and demonstrated in detail.